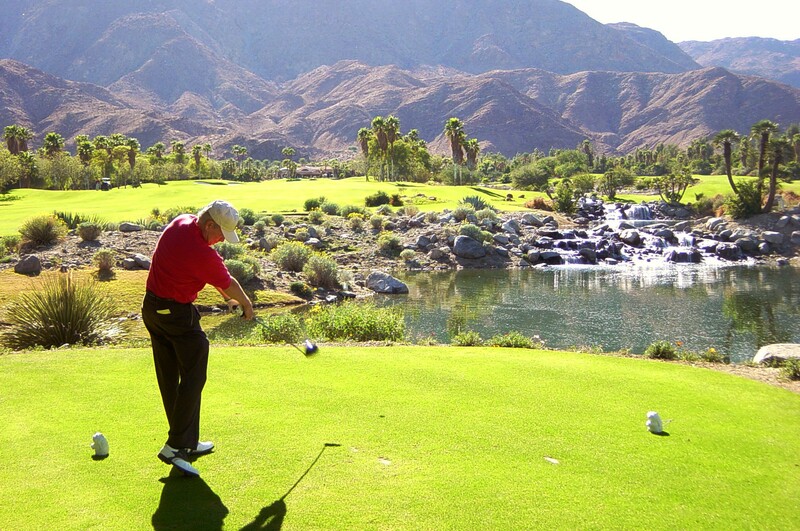 I was fortunate enough to play Larry Ellison’s ultra private Porcupine Creek in Palm Desert, California. At the time, it was designed and owned by developer and timber baron Tim Blixseth. I hit this drive well enough on the par-five 18th to set up an eagle putt – not always the case when playing different courses! 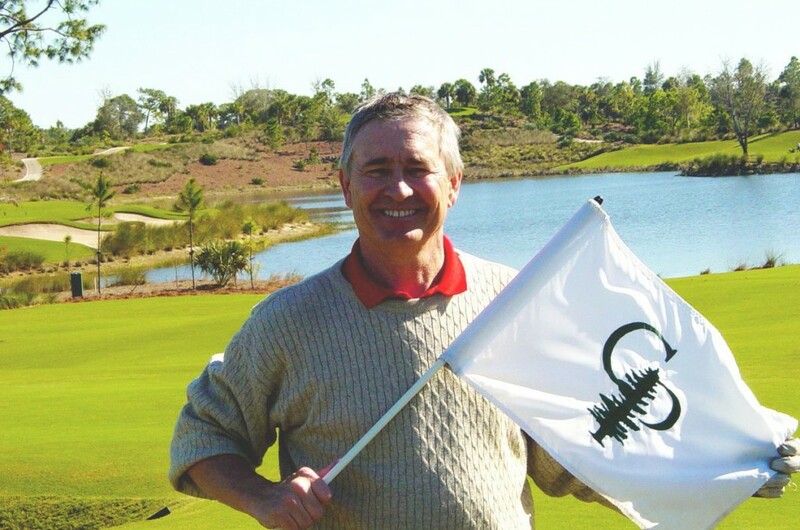 In January 2005, I finished my morning round at Calusa Pines in Naples, Florida and completed playing the Top 100 Classic Courses and Top 100 Modern Courses as defined by Golfweek Magazine – the Top 200 Courses if you will, and the first and perhaps still the only to do so. In a separate effort partially intended as research for a book on Classic Courses, I estimate that I’ve played the top 250 or so courses in America built before 1940, which may be an even more monumental feat as many of these places are fiercely private. Anyway, as I’ve been encouraged to write on these adventures and when I’ve noted others writing books on playing half or less courses than this, I thought that at least an article might be in order. Finishing the quest to play the Top 200 in America at Calusa Pines in January, 2005. I have a passion for playing different golf courses, the best, the good, and any others that may come my way. I love golf course architecture and challenging myself to live out those experiences that I have heard so many friends talk about or have read of has become my golfing passion. Even more fun, playing in so many locales, it’s a quick and easy way to connect with someone I meet as the chances are, I’ve played somewhere close to where they live, and perhaps either their home or favorite golf course. As for the lesser-known courses, I’ve found many hidden gems, met some truly nice and remarkable folks, and discovered that the best golf courses don’t have any monopoly on best golf experiences. To that end, my list of courses played has passed 2,700 including more than 1,200 course listed on the Golfweek Magazine Ballot. Now with more time to play, I hope to add some serious numbers to that total. What was the toughest course to get on? Well, no course is tough to get on if you know the right people or have a friend who is a member and many are next to impossible if you don’t. No, it wasn’t Augusta National, Pine Valley, or Porcupine Creek. For me, the next to last course of my quest to play the Top 200, the Bear’s Club in Florida, took many months of networking before finding a friend of friend was gracious enough to sponsor my round. As far as Augusta National was concerned, I had five close-calls before getting on. I haven’t been back since their changes and my sponsor has long passed, and I’d love to replay it one more time. What was your favorite course? That’s really a hard question. I have a special place in my heart for Cypress Point and National Golf Links on the opposite sides of the continental U.S. Pine Valley is the best in my opinion – hands down. Augusta National may be the ultimate experience, while Merion’s East Course is both an architectural and historical gem. Pacific Dunes, Old Macdonald, and Ballyneal all designed by my good friend, Tom Doak, are tremendous and qualify as my modern favorites, while I had my best 36-hole score at Sand Hills. Virginia’s Kinloch by Lester George really impressed me as a fantastic modern parkland style layout and Baxter Spann’s desert work in New Mexico at Black Mesa is also impressive. Another modern course that gets my attention in The Rim in Payson, AZ. I’m sure that I’m leaving out old favorites like Oakmont, Shinnecock Hills, Pebble Beach, Seminole, Shoreacres, The Golf Club, and Long Cove. You have studied golf course architecture and design since 1965. Did you ever consider a career in the field? Yes, I was looking at landscape architecture programs at the University of Georgia and University of Virginia for the purpose of becoming a golf course architect, but I decided the curriculum was too confining and might limit me from other careers should it not be my cup of tea. In hindsight, it was the best move. I was able to achieve some success in building teams and affecting some business turnarounds and more importantly, raising a family would have been very difficult if I was always traveling to build courses. I admire what the architects do particularly in the agronomy, subterranean, and drainage engineering areas whereas I have always felt more confident in my artistic, imaginative, and visualizations skills. Getting to play many courses, I have had the opportunity to enjoy their finished products without the snake or bug bites, injuries, soliciting for business, travel, or the politics that are an integral part of the business. You mentioned hidden gems? What might be a few of those you’ve discovered? The Flynn-designed courses in Philadelphia of Lancaster, Rolling Green, Manufacturers, Huntington Valley, Philadelphia CC, Lehigh, Green Valley, and Philmont North along with George Thomas’ Whitemarsh Valley are just a few there that never get their due. And as far as cities are concerned, no one touches the quality of architecture of Philadelphia – Greater Delaware Valley unless you head north to the more extended areas of Long Island/Northern New Jersey/Westchester County, which may have even greater numbers of impressive courses. Either area has so many great courses that no one has ever heard of. And as for the links golf I love, nothing compares to the rugged coastal course in Ireland though I admit to needing to play more in Scotland. And The Old Course at St. Andrews is an evolutionary genius of nature. And talk about sleeper areas, I’ve played 29 really good courses in the Minneapolis-St. Paul area and both Columbus and Pittsburgh have a wealth of really high quality golf courses that overshadow far larger cities. As far as a State is concerned, Michigan has so deep with great golf courses; ones that few out of the area have ever heard about. The other interesting thing is that many clubs have renovated or restored their golf courses. Palo Verdes GC in California recently did so and went from a ho-hum looking respectable test to a really captivating and special layout. Others have too. Who are your favorite golf course architects? I count many of today’s well-known designers as personal friends so I hesitate to name them, but there are so many talented ones. Often the results depend on the budget, the client, land/environmental restrictions, land planners, shapers, etc. As for those who have passed on, William Flynn and Seth Raynor/C.B. Macdonald get my votes along with all the usual suspects like Mackenzie, Ross, Tillinghast, etc. Look around long enough and there are works by the same person you like and those that resonate less. Besides, once a course is designed and operating, the operators and superintendents may have a great deal to do with changing the design. Speaking of score, how have you fared on these courses? I will be quick to say that my claim to fame has been playing the courses and not scoring on them, but over a fifty-year plus span I’ve been fortunate enough to enjoy about four decent stretches of good playing or else caught some lightening in a bottle – something I might now do once in about 40-50 rounds. For example, one course that I once shot a smooth 66, I returned years later to fire a humbling 94 under ideal conditions. Despite a 3-putt on the last green, my 36 hole total at Sand Hills of 129 is still a personal best and a 61 at Atlantic City CC since its Doak renovation and Predator Ridge – Ridge Course (Canada) are my best 18-holes scores among the elite courses. Competitively a 66 around Winged Foot’s West Course is a best. I guess my biggest bragging point would be that I have broken 70 at one time or another on virtually all of the Top Twenty Courses (on something like 23 of them that have made the list), though only a precious few in the last dozen years. If you saw me play today or checked my index, you would absolutely swear I was lying! What was your secret to getting on all these courses? My quick answer is friends, networking, energy, and sacrifice. Working for the PGA and for a short while competing, being an active member of the golf media, rating courses for two of the leading magazines, and living in different parts of the country have afforded me many wonderful friends and golfing contacts, as well as access to different courses. As a person of modest means, I took an entry-level position in late 2001 with Southwest Airlines and for 30 months was able to fly almost at will to finish playing the last sixty or so courses. I have been fortunate to enjoy great health and uncommon energy, so I am able to play more in a shorter time than most anyone I’ve met. Any tips to getting on prestigious private clubs? Yes, apart from networking with people, keep your eyes out for charitable events. Elite private clubs will often open their courses for play to charitable fundraising events. Participating in these can gain you precious access to play and also help fund a good cause! Who are your course-playing heroes? I have two. One is my friend, Bob McCoy who has split time between New Jersey and Florida. Though I have played about two thousand more courses than he has, Bob’s focused on “international quality.” McCoy was the first to play the World’s Top 100 Golf Courses and years later he accomplished playing those same courses in 100 days! The second is a New York man, Ralph Kennedy, who died in 1953. A Winged Foot member, Kennedy allegedly played more than 3,600 courses and this was before the advent of jet planes, Interstate highways, and riding carts. That’s pretty impressive! Have you played the most courses of anyone alive? Heavens no, I certainly doubt it, but with good health and fortune I may end up close to the top. I believe that there are several who have played more, but I may have played as many of the best American courses as anyone. It is possible that I also may have played with more different people on more different courses as anyone as I often go as a single and get paired up. I do keep records of every round and every course played and only count courses I’ve fully played. I am aware of a couple of people who have claimed to have played many or more courses, but in checking on several of them find quite a bit of exaggeration, discovering that they are only estimating or that they’ve simply visited the course or played a few holes and not a complete round of golf. In the big scheme of things, who cares? Actually you will be surprised to learn I don’t play nearly as much as people think. I play golf in binges. I may play 60-110 rounds a year virtually always playing new courses and in 6-9 bunches. Twice I have played 35 courses in 10-11 days while also driving 1,800 miles. Until a decade ago, I could remember every hole on everyone. While the memory has faded, my stamina continues (knock on wood). When home in California or Northern Nevada, I seldom play and regularly will not touch a club for 3-15 weeks at a time. If I’ve played a golf course, my urge to re-play it drops and given slow play, I have no interest anymore in competing. However, now working as a golf and travel writer, the opportunities to play more regularly may pick up. Where haven’t you played that you’d like to? While I am well played in the U.S., Canada, Ireland, and New Zealand, I’m a relative newbie when it comes to the rest of the world and with good health and fortune, hope to focus on those areas in the coming years. Any funny or unusual occurrences or mishaps that you encountered playing all these courses? Now there’s enough material to write a book! One of the most embarrassing moments was playing on a “first date” with a fairly well-known lady in the golf industry at the time on a very prestigious Central Florida club. I blocked my tee shot on the par-five opening hole over some high mounds into an adjoining fairway. More than a bit nervous and in a hurry to get out of the way of an oncoming foursome, I rushed a bit and quickly hit a strong 3-metal back into position only to hear some shouting directed toward me. Here I had hit former Major League Baseball player and manager Davey Johnson’s ball who was finishing a money match. Oops! Actually he was quite nice about it, but boy was I embarrassed… Actually, that is only the beginning of the bloopers as well as famous and interesting people and crazy circumstances I’ve encountered traveling and playing a round! Anything left you’d like to share? I’ve been blessed to be able to travel and play golf in what may prove to be the game’s zenith. Golf is a great way to make friends and also learn about yourself. When you do get an opportunity to play a new course, try to be a great guest and fun companion. When you hit a bad shot, try to learn from it and enjoy that opportunity. Have fun with your golf! I count Cypress Point as my favorite! 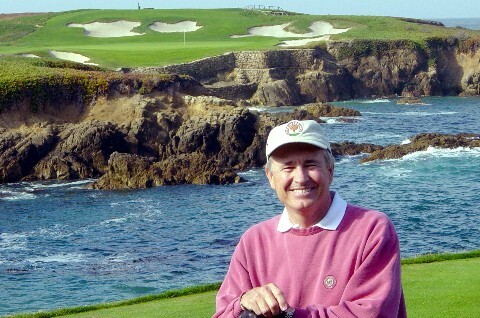 Bob Fagan features one of the most interesting backgrounds in travel and golf. Not only it is likely that Bob has played more American golf courses than any living person, he has been an accomplished player and instructor, holds a Ph.D. in Counseling, has been an innovative golf and life coach, PGA Section Executive Director, golf company executive, "Expert Golf Witness," and, of course, a highly acclaimed travel and golf writer. I just finished playing the Golf Digest Top 100 Courses in America in one year. I read Bob McCoy’s book so I have a sense of how many people have played the top 100 in the world. Do you know how many have played the top 100 in the US? There are no definitive records for this and anyway it’s all based on the “Honor System.” In January, 2005 I finished playing the Top 200 as defined by Golfweek Magazine and several authorities stated that no one else had. Reportedly one fellow is currently stuck at 199. I now count about 382 of Top 400 as defined by the Golfweek Magazine listings. At the end, what does it matter?